Located for several years in Davis, California, Dr. Raymond Spore has been treating customers with a smile, respect and genuine caring. What sets him apart from some other chiropractors is that he personally respects health and the ability to maintain it through an active lifestyle. Now he is also joined by colleague and alumni Dr. Dan Walker, D. C. who shares the same views and ideals to help heal those who come for help. 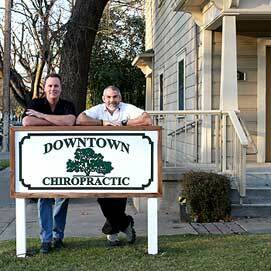 Read more about Dr. Spore and Dr. Dan Walker. 'I had back and neck problems for several years prior to moving to Davis and tried lots of different things between Medical Doctors, physical therapists, etc. to keep my body in balance and functioning for all of my activity. I also tried a number of different Chiropractors between Davis and the Bay Area. If you are suffering from a sudden injury, a chronic injury, or want to maintain the balance of your body come and make an appointment with Dr. Raymond Spore or Dr. Dan Walker and give your body the help it needs to stay well. Student discounts, senior citizen discounts and sliding scale fees are available. Call the office for more information or make an appointment now at (530) 758-5554. You can also email at rcspore@sbcglobal.net..